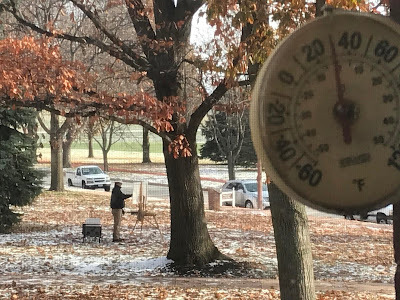 Early yesterday, Veterans Day, I hauled my wagon of painting gear across the street and stood, facing south, in the below freezing but calm air about 20 yards from historic Quarters 12 - built and first occupied 23 years before the end of World War I (100 years ago yesterday). Applying logic to the in-house registry dating back to 1949, we are, give or take, the 60th resident family. I painted our momentary home, still surrounded by patches of snow, bathed in strong morning light. The painter resident of Quarters 12 who stood out in the cold. History, and veterans, on my mind while painting (my late dad, an Air Force veteran, taught me to draw and paint). A couple of hours later I loaded the wagon and returned home for a cup of pressed hot coffee to warm blood, bones, and soul and study the painting. About half way through the coffee I saw a news clip. President Trump, too, stood in the cold (and wet) - to paint not in oil but with moving words a picture of World War I and its welcome end; to which he said with air of relief, "Thank God." Before President Trump's eloquent remarks the leaders of Germany and host country France took the solemn occasion to hurl bombs, cheap shots, at our President. A better example of bad form escapes me. Frenchman President Macron said, referring to his American guest, "Nationalism is a betrayal of patriotism." No, President Macron. You are wrong, Monsieur. Dead wrong! And weak. And timid. The absence of nationalism is certain death of a country. Look no further than to the land you call home. Look what is happening to Sweden (a country I first visited in 1989 and now have difficulty recognizing). Look what is happening to America. Nationalism and globalism (or whatever the current pc term for planetary community) are not mutually exclusive. In fact, exclusivity - as to culture, customs, traditions, courtesies, etc. - makes for strength. By definition that's patriotism. To dilute (most anything) weakens. Though somewhat uncharacteristic, President Trump exercised incredible restraint not countering with true (justified) sarcasm - as to World War I and World War II (less that ceremony yesterday be spoken in German). There's resistance abroad and home to our President's determination to build a border wall - the objective of a "nationalist" - a necessary measure to delineate and better safeguard country. Though a border wall important more so of importance is internal walls; one of which is justice. Without the wall of justice, more so than border wall, we have no country. It will be the death of freedom, the death of us. President Trump, Sir, please explain to the citizenry, especially your loyal supporters, how and why is it Hillary Clinton has not yet been charged with (malicious) dereliction of duty compromising classified material and national security while secretary of state? Be neither weak nor timid, Mr. President. Betray us not. Be a patriot! "Though a border wall important more so of importance is internal walls; one of which is justice."